A blog by Timothy Lee, Sydney | Multiply Opportunities; Divide Problems. Long before the opening of the Waldorf Astoria Shanghai in April 2011, back in 1910, this six-storey Baroque Revival building located at No. 2 on The Bund was the newly rebuilt home of the Shanghai Club, a Men’s Club for wealthy powerful British Citizens, replacing the old three-storey red brick Club House built in 1864. The outbreak of war in 1941 forced the closure of the Club and the building was used as various clubs and hotels after the war. It also became home to the first KFC restaurant in Shanghai from 1990 to 1996. Thereafter, the building sat derelict until it was leased by the Hilton Group in 2009 which saw the birth of the luxury Waldorf Astoria Shanghai on The Bund. Today, the century old heritage listed building is home to the Waldorf Astoria Club compromising 20 luxurious suites, restaurants and the famous long bar with its 34m bar counter, once the longest in the Far East in the early days of 1910s. Waldorf Astoria Club is adjoined by the new Waldorf Astoria Tower which has been seamlessly incorporated into the architecture of the entire complex, perfectly blending heritage nostalgia and modern classics. 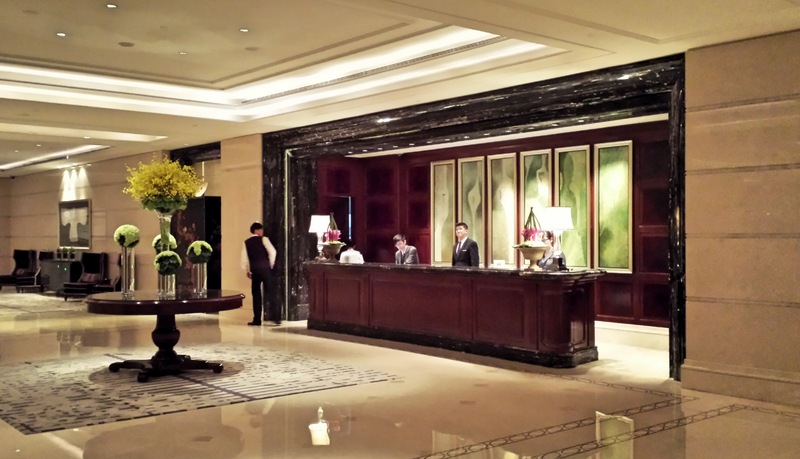 Two buildings combined, the Waldorf Astoria Shanghai comprises 260 luxurious rooms and suites. Legendary service, distinct personality and allure is what the Waldorf Astoria brand promises and this was definitely evident. The service started even before our trip began when they arranged reservations at a few restaurants I wanted to try in Shanghai. Blown away by this stunning property on arrival it’s not hard to understand why this is one of the top five-star hotels in Shanghai.All staff members spoke fluent English and our personal concierge was very attentive to our needs ensuring we had a comfortable stress-free stay. They even helped us repacked a large box of goods that we were taking back to Sydney. Our spacious Deluxe River Room was stylishly decorated in classical European style with plush amenities. Walk-in closet, Nespresso machine, fresh fruit platter, state of the art in-room entertainment, electronically controlled blinds and lighting system, and a marble-finished bathroom featuring double vanity with bathtub and separate shower. The TV in the mirror and the automatic heated WC and Salvatore Ferragamo amenities are worth a particular mention. Best of all was the amazing view of Huangpu River and Pudong from our room on the 20th floor. Although there were days when the smog was so thick you could hardly see anything but when you could, the view was to die for. A tranquil heated swimming pool and whirl pool is available for guests on level 3 of the Tower along with steam and sauna rooms, and a well-equipped fitness centre. The Waldorf Astoria Spa is located on the same level and according to my wife they provided one of the best spa treatments and experience she’s had in some time (now that’s quite a compliment). There is no Executive Lounge like other Hilton properties so breakfast was served in the Grand Brasserie where you have a buffet selection as well as a la carte options. Combined, there is an extensive and delicious selection on offer but having stayed five nights, it did become a bit repetitive. On the topic of dining, the in-house Chinese restaurant on the top floor of the Waldorf Astoria Club building – Wei Jing Ge – was so good, we had dinner there twice during our stay. The Chinoiserie interior design creates a warm and sophisticated ambience combined with top notch attentive service. Head Chef, Sam Yuen is from Hong Kong so there is a huge Cantonese influence in the menu which is probably why we enjoyed it so much. There’re plenty of other dining options close by, especially if you walk out to Nanjing East Road which is about 15 mins away. A stroll along The Bund after dinner is the perfect way to admire the past and present Shanghai. On one side you have the Paris of the East (The Bund) and across the river, this ultra modern neon-lit concrete jungle of Pudong that didn’t even exist just 20 years ago. Whether it was a century ago or present day, Shanghai is no doubt a dazzling metropolitan. Expensive as it is, the Waldorf Astoria on The Bund is truly a special place and worthy of carrying on the opulent history of No. 2 on The Bund well into the future. I love staying at hotels, new and luxe ones that is. Met with a warm welcome as you enter a grand lobby and opening the doors and seeing the sophisticated and thoughtful interiors of a fresh immaculate room…’I ❤ Hotels’ is a series where I share hotel experiences that I’ve thoroughly enjoyed.